Alumni of Rush Medical College, College of Nursing, College of Health Sciences and the Graduate College are invited to use Rush’s library services and facility. For more information, please visit the Rush University library website. Connect with fellow alumni from all four colleges with the Rush Alumni Directory. Alumni who would like to purchase custom regalia may do so through the University’s vendor, Herff Jones. Additional information and directions may be found on the Commencement website. Rush University alumni with family members interested in a career in the health sciences can learn more about Rush University admissions. If you are a Rush University alumnus, and your family member is specifically interested in Rush Medical College and has not yet submitted their AMCAS application, they are invited to attend an upcoming Legacy Day to learn more about medical school admissions and hear from current medical students about the application process. If you have additional questions, please contact Anna Seghetti in the Office of Alumni Relations at anna_seghetti@rush.edu or (312) 942-7199. 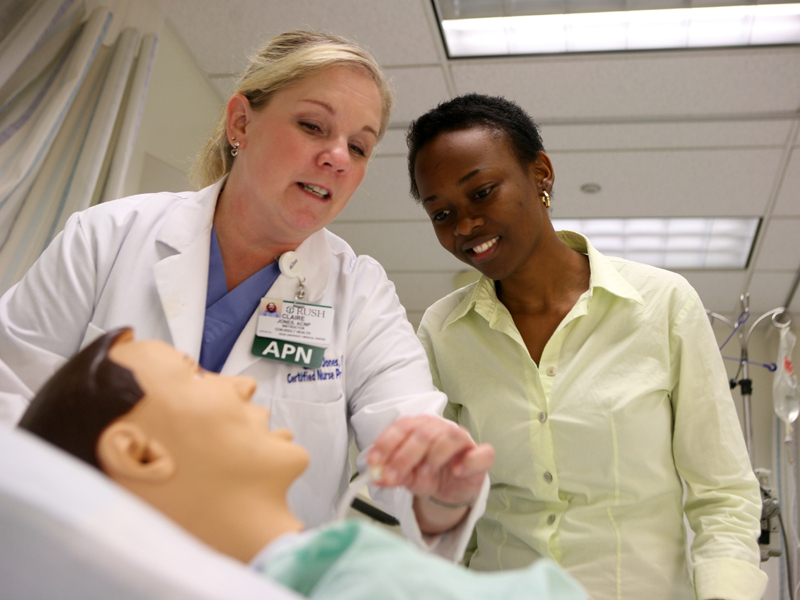 Alumni are welcome to use the innovative Rush Center for Clinical Skills and Simulation. In an expanded, high-tech center that opened in 2014, Rush’s simulation labs are specialized training facilities equipped with life-sized, computer-controlled patient simulators. There, all levels of health care providers learn medical procedures in a highly realistic environment. Our onsite classrooms, labs and equipment help create an immersive, high-value learning experience that incorporates the best practices of simulation education. Special rates can be arranged for clinical refreshers in all primary and acute care specialties. Come alone or bring your team. Learn more at the RCCSS website. To review available time slots or to schedule a tour, contact Nathan Walsh at (312) 942-2576 or nathan_walsh@rush.edu. Rush offers a collaborative environment that fosters innovation, strives for excellence, nurtures respect for others and ensures accountability in delivering world-class care to our patients. Search our open positions online. For continuing education opportunities, both online and in person, visit Rush’s Continuing and Professional Studies website. CashCourse is an online financial literacy service available to all Rush alumni. CashCourse covers topics such as budgeting, investing, savings, credit, identity theft and more via their website. Please visit our Services page for information on Rush transcripts and financial aid. Rush University alumni apparel is available at the Matthews Rush University Bookstore. Visit the bookstore online to view the newest merchandise supporting your alma mater. The Office of Alumni Relations is ready to assist you. Here’s how you can reach us.